I feel as though I could conquer the world in the right pair of boots. I invested in these Sorels last winter when I made the realization that getting my feet damp on the walk to work could leave me grumpy for an entire day. Those who live in warmer climes may suspect these boots to be over-the-top for daily wear but I assure you that in Toronto, they are the height of winter fashion. 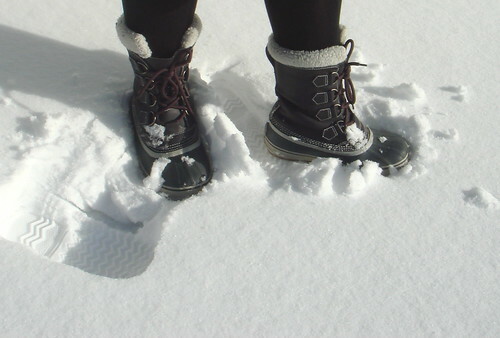 In these boots, I stay warm and dry when wading through ankle-deep slush or climbing over formidable snowbanks. Whenever I wear them I think, "These were an excellent purchase." Really, I love them. They have improved my quality of life. Sorel boots were first made in my hometown of Kitchener-Waterloo. From childhood, I can remember the Kaufman Shoe Factory on King Street. Its logo was a big, walking K with pointed shoes on the 'feet' of the letter. Retro fabulous! According to the label on my pair, Sorel boots are now manufactured in Vietnam. I wonder what they think of us and our extreme footwear in that sunny land of plastic sandals. Note: this weekend's forecasted Snowmageddon was not as devastating as predicted. These winter boots are perfect... Great chocie! !